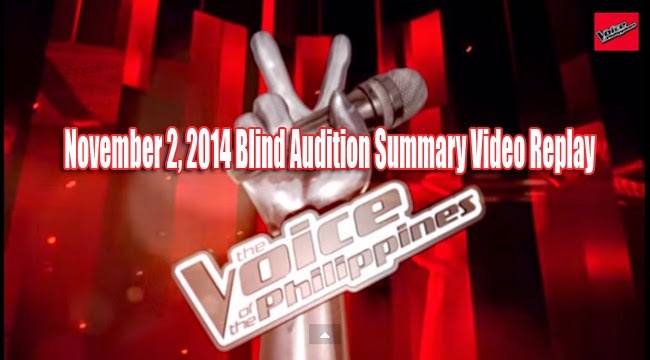 The Voice Season 2 November 2, 2014 Blind audition summary video replay will surely be an exciting one. Who will be added to Team Lea, Bamboo, Sarah and APL? It’s for you to find out. We have watched how talented artists from different parts of the country crossed their fingers on the opening episode of The Voice Season 2 last week. And on the 2nd episode of the most popular reality singing contest in the country today, we had not been disappointed as more mind-blowing talents had surely enchanted viewers and make the Sunday night viewing more exciting. The first performer to get on the stage of The Voice Season 2’s second episode is the self admitting shy type guy Marc Cando who had mesmerized Coach Apl De Ap with the song ‘Get Here’. Cando bashfully admitted that he had a crush on The Voice host Toni Gonzaga. The host had gamely came up the stage and received a rose from Cando accompanied with a pick up line taught by his new coach. The second voice that amazed the audience and received four turned chairs was Kai Honasan, the youngest daughter of Senator Gringo Honasan. Kai had been challenged to make a name for herself and had chosen music to be her own path. She had sung ‘Teenage Dream’ and picked coach Bamboo in hope to develop her kind of music. The seventeen year old wake boarding enthusiast , Daniel Ombao, left his home in Bataan to be a musician. He was able to prove his talent to his father Sarah immediately turned her chair and her eyes never left the artist. He joins Kokoi Baldo in Coach Sarah’s team. Karlo Mojica had inspired the coaches as he had sung ‘Bulag, Pipi, Bingi’ in his wheelchair. Apl De Ap shared that he felt the same advocacy that disability cannot hinder a talent at the coach admitted that he is legally blind. Mojica admitted that he has the same goal with Apl but had chosen Bamboo because he felt that Bamboo will be able to better develop his style. Bamboo was surprised that he was picked and was honored. The fifth to succeed in passing the Blind audition is the 31 year old Bradley Holmes. Apl De Ap, Lea and Sarah immediately turned and seemed to enjoy themselves as he sings with his own style. Brad had chosen Apl De Ap because he wanted to explore his musical talent but Lea voiced out that she has her eyes on him come the battle rounds where a coach can steal an artist. On the teaser video of the episode, the coaches have shown their support to the artists. There were also funny moments which made the program worth looking forward to. Several faces of artists with different singing styles were showcased on November 2 and the four coaches had given their greatest convincing power to have their desired artists on their teams. Watch The Voice of the Philippines Season 2 on Saturday at 7:30pm(After MMK) and on Sunday, 8:30 PM after Rated K at ABS-CBN Primetime Bida.